My name is Phillip Simpson. 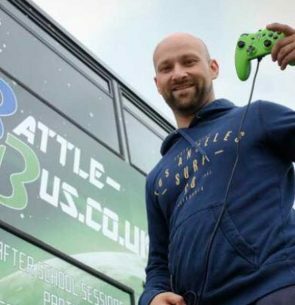 I along with my partner Lauren Key created battle bus. We as parents noticed our childrens lives were becoming increasingly anti social. They went to school, came in headset on, console and tv on, gaming with other children from there groups of school friends rarely developing other friendships. We went through varous stages to try and change this. The angry parent – your playing it to much, go out play with your friends, invite them over. To which the reply was no. If i go out nobody with play out cos they on the computor. If i invite them over that means we have to take it in turns to play. Not completely understanding this i delved further into reasons why the kids couldn’t interact physically.